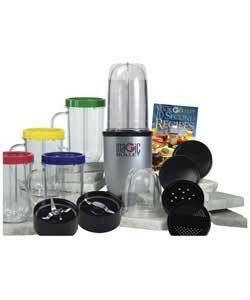 Magic Bullet Express™ replaces mixers, blenders, food processors! Blends juice drinks into the cup. Torquey base powers cross blade or flat blade to chop, dice, grate, grind, whip. Mixes, blends, whips. Makes smoothies for a group or individually.